VATICAN CITY (CNS) — Eradicating male and female identities does nothing to solve the problem of unfair or disrespectful treatment based on people’s gender, Pope Francis said. “Getting rid of the difference is the problem, not the solution,” he said April 15 during his general audience in St. Peter’s Square. The right way to solve the problems and conflicts in male-female relations is to have men and women “talk to each other more, listen to each other more, know each other better, care more for each other,” he said. The pope continued a series of general audience talks about the family by beginning the first of two talks on “the difference and complementarity between men and women.” He said the two talks would serve as the foundation for two later talks dedicated to the sacrament of marriage. At the end of the audience, Pope Francis personally greeted the husband and a daughter of Asia Bibi, the Pakistani Christian woman sentenced to death in 2010 under Pakistan’s controversial laws against blaspheming Islam. Bibi’s family came to Rome as part of a campaign to rally international support for her release. In his main audience talk, Pope Francis said that when God created humanity in his image, he did so for man and woman together, “as a couple,” in a state of sharing and harmony. 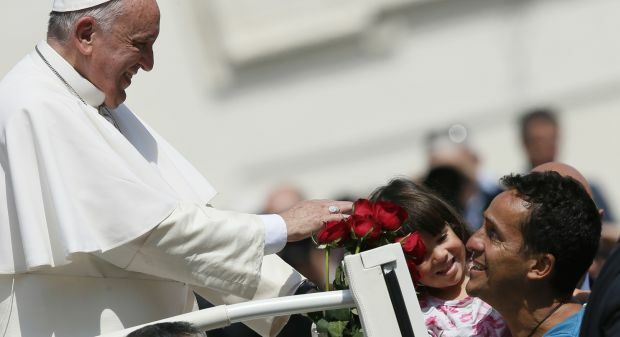 Sexual differentiation, therefore, exists not for creating conflict or a situation of subordination, but for reciprocity and fruitfulness — “for communion and generation, always in the image and likeness of God,” the pope said. Modern culture has done much to open up a new and deeper understanding of men and women, “but it also has introduced many doubts and much skepticism,” he said. “For example, I wonder if so-called gender theory may not also be an expression of frustration and resignation that aims to erase sexual differentiation because it no longer knows how to come to terms with it,” the pope said. “God entrusted the earth to the covenant between man and woman: its failure drains the world of affection and obscures the heavens of hope,” he said. “The first: It is beyond question that we have to do much more in favor of women,” such as making sure “that women not only are listened to more, but that their voice carries real weight, (is) an acknowledge authority in society and the church,” he said to applause. Humanity has gone only “a tiny way” along the path God wants everyone to take, he said. “We still have not grasped fully the things that the feminine genius can give us, what society and we can be given by women who know how to see things with another pair of eyes that complement men’s ideas. It is a path to take with more creativity and audacity,” he said to more applause. Men and women “must treat each other with respect and friendly cooperation,” and once this proper basis is created with God’s grace, solid marriages and families can be built, he said. “I would like to urge intellectuals to not abandon this subject, as if it had become secondary to the task of promoting a freer and more just society,” he said.